Desktop Defender 2010 is the latest in fake security tools, disguised as a legitimate antispyware application, this dubious applciait0on will only cause damage to any system it has infiltrated. Desktop Defender 2010 hails from the same rogueware family as Contraviro and UnVirex. Desktop Defender 2010 is sneaky, and may hide itself within registry files on an infected system; therefore there are a few sure ways to tell whether your system may be in jeopardy of infection. Download and install a reliable anti-spyware program, one that will recognise the current form of Desktop Defender 2010, as well as other forms of spyware. One will need to remove Desktop Defender 2010 from the infected computer system, as soon as it has been detected. The thing about Desktop Defender 2010, and many rogue anti-virus applications, is that fact that it is extremely difficult to delete from an infected system. All in all though, I would recommend that one should make use of a reliable and legitimate, fully functional, up-to-date anti-spyware application, to remove Desktop Defender 2010 and all its components from the infected computer system. 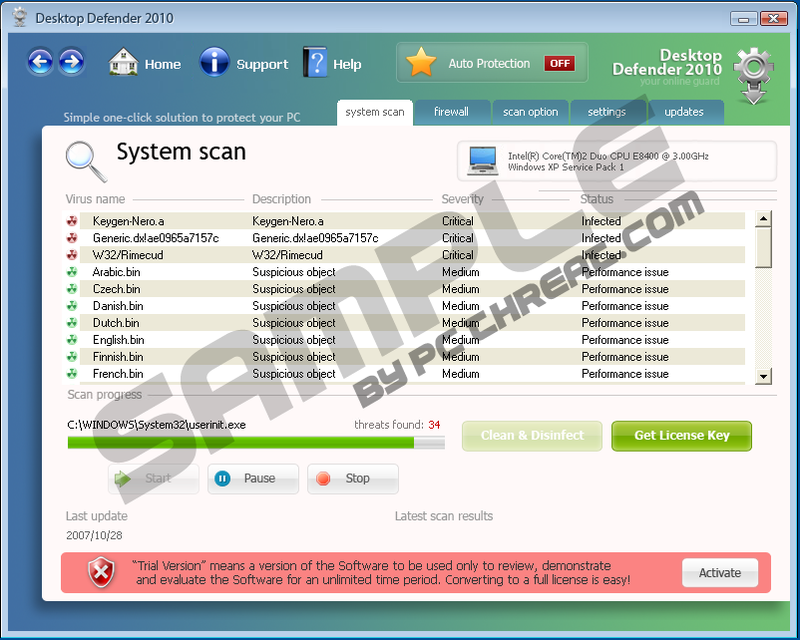 Quick & tested solution for Desktop Defender 2010 removal.